I’d like to wrap up my series on St. Lawrence Cemetery by showing you some more of the monuments and markers that got my attention while I was wandering around. The one that got me the most excited was this one. Seeing an Abrams cast iron grave cover is like winning a lottery in my world. I let out a shriek of joy in my car when I caught sight of it. 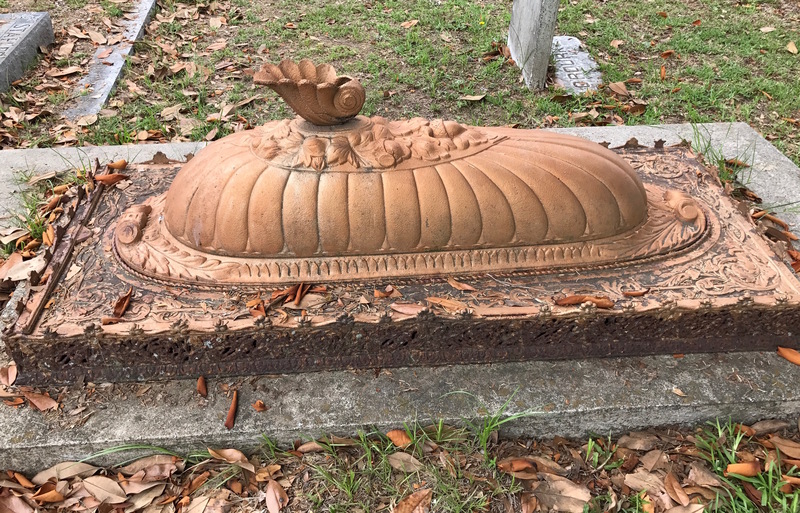 You may remember I did a post on Joseph R. Abrams, inventor of the cast iron grave cover, a few years ago. I first saw one in Fairburn City Cemetery and have delighted in discovering them ever since. 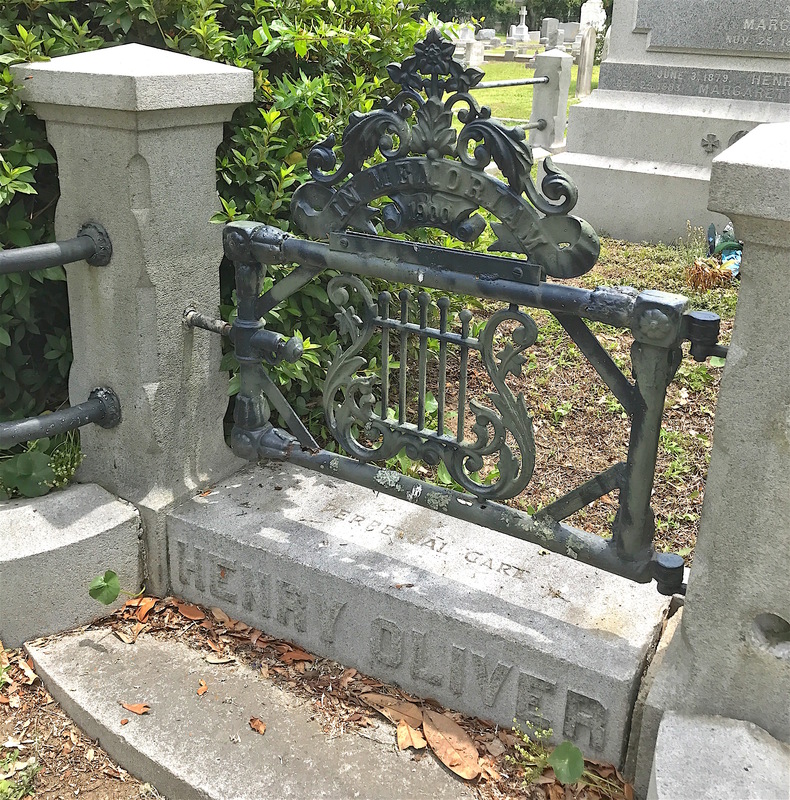 A successful businessman, Abrams designed and received a patent for a unique cast iron grave cover in the 1870s. They’re usually found in Southeastern states but you can occasionally find one in Texas or the Midwest. Abrams spent his last years in Alabama and is buried there in Greenville Cemetery, where you can see a big collection of these markers. He died in 1880, only a few years after his patents were granted. They were made mostly for children’s graves because of their smaller size. This is the first time I’ve seen an Abrams grave cover in this color before. What sets this one apart is that it’s painted a coppery color, which I’ve never seen before. I don’t know if it was this way originally or if someone painted it later. It certainly made it easier to spot from my car. If you look closely, you can see Abrams’ name and the years of his patents (November 1873 and Mary 1874) on the edge of the marker. 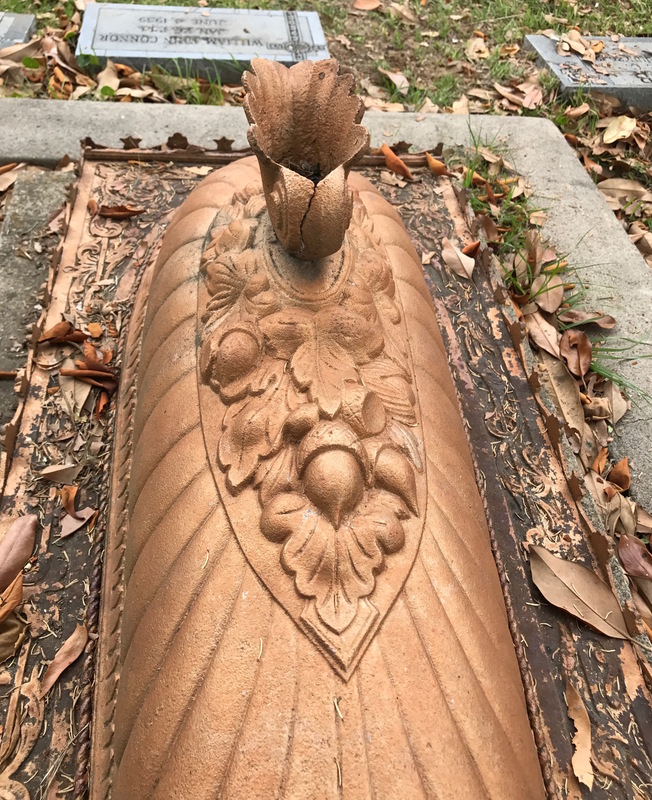 These graves covers, when originally made, had a name plate attached to the back. Because of the nature of the metal aging over time, most have broken off. The only identification is the name R.C. Millings on the plot border. Born in 1833, Richard Millings was a Charleston merchant who sold various items over the years, from boots/shoes to furniture. The seashell finial on top is cracked but still intact. Other covers featured an infant underneath flowers or an open book. I don’t believe this is the grave of Richard Millings but for one of his children. These covers were manufactured in the 1870s and early 1880s. Millings died at the age of 80 of dysentery in 1905, long after these stopped being made. 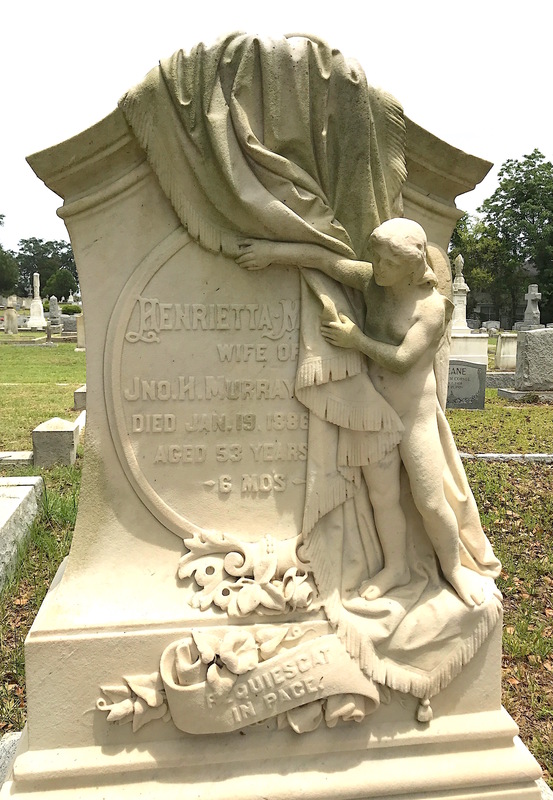 His wife, Emma, died in 1913 and is buried in a different plot with her own slab marker. 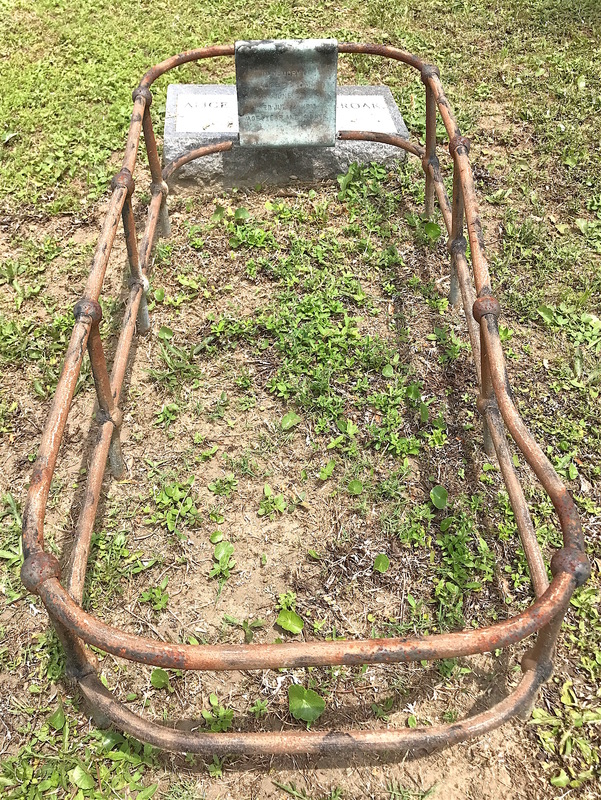 It’s possible he is buried beside this child in this plot, but I don’t know for sure. One of the more unusual monuments was for Barnard Fitzsimons, erected by his sister Mary Ann. I had little idea that there was quite a story behind the settlement of his estate. There’s even a clue on the monument itself. Upon first glance, you wouldn’t know the drama behind this monument. Barnard Fitzsimons and his sister, Mary Ann, were natives of County Down, Ireland. They came to America as children and were living in Charleston by 1850. Barnard was a successful saddler, operating a harness store. Sometime between 1850 and 1859, Barnard (then in his 30s) married Pamela Carre (or Carrie) from Augusta, Ga. Their only daughter, Eugenia, was born in 1857. 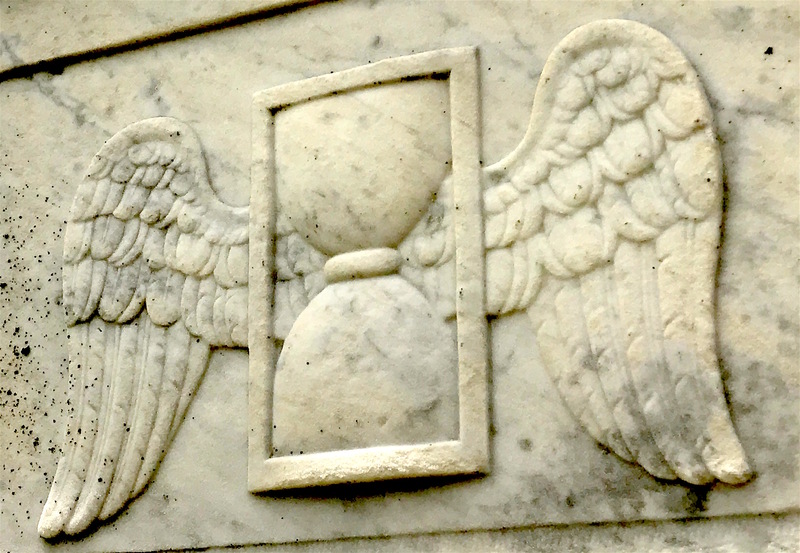 This detailed hourglass on the Fitzsimons monument was a motif more common in the early 1800s. It was done by R.D. White, one of several Whites who were carvers that created stunning monuments throughout Charleston and the Carolinas. The trouble started after Barnard died in 1859 at the age of 42 (according to his death records, it was from “brain compression”). His will left his entire estate to Mary Ann and Eugenia, even leaving the young child in her care. As this was on the eve of the Civil War, the timing was unfortunate. Pamela took Eugenia and headed for Augusta before settling in Savannah to live with family. Needless to say, Mary Ann was not happy with her sister-in-law. Mary Ann filed a lawsuit against Pamela that reached the U.S. Supreme Court in 1867. Being that Confederate bonds backed the estate, who got what became even messier. After reading the case report a few times, I still don’t understand what the result was. An inscription on Barnard Fitzsimons’ monument. I’ve not seen it on any other monument before. From what I can gather, Eugenia remained with her mother in Savannah and never lived with Mary Ann in Charleston. Mary Ann is listed in the 1879 Charleston directory as living alone. In the 1880 U.S. Census, Eugenia is listed as living in the household of her aunt and uncle along with her mother. 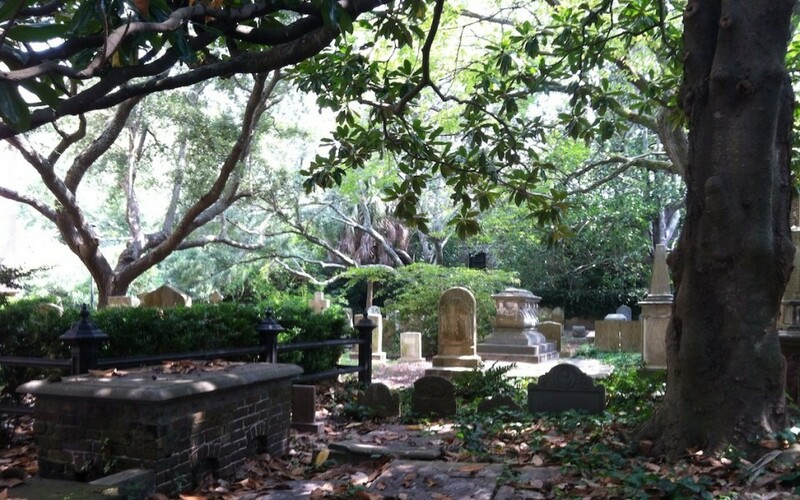 Pamela died in 1900 and is buried in Savannah’s Catholic Cemetery. Eugenia never married and died in 1935. She is buried beside her mother. Mary Ann must have smarted over the loss of her brother and felt animosity toward her sister-in-law. 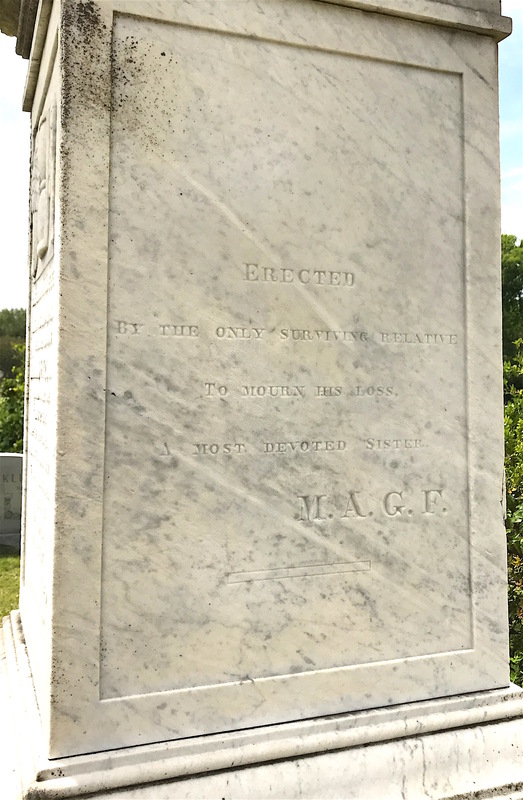 That can be inferred from an inscription on the side of Barnard’s monument in which she claims it is erected “By the only surviving relative to mourn his loss. 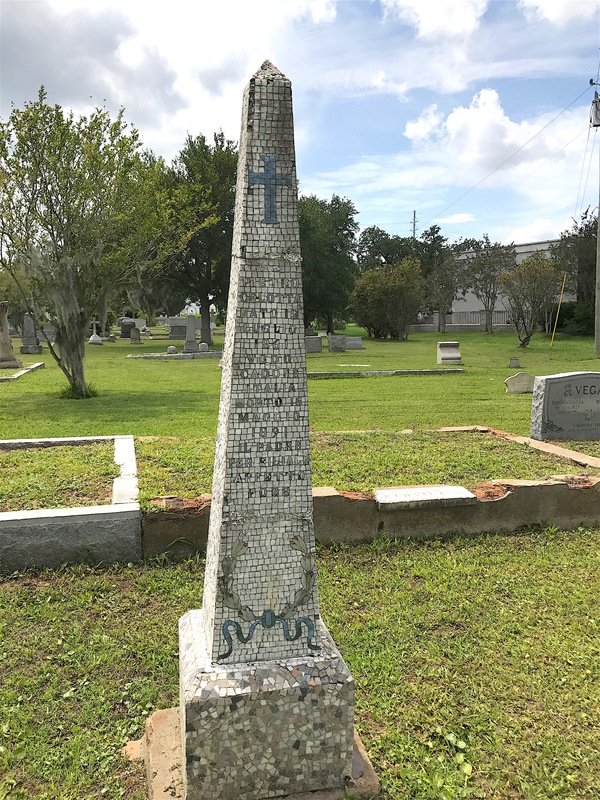 A most devoted sister.” She died of typhoid in 1889 in Charleston and is buried at St. Lawrence but has no marker of her own. I suspect she is buried beside her brother. Barnard’s sister had to have the last word. By contrast, the grave of little Alice Croak is quite humble. It is a metal enclosure with a simple battered sign on one end. She does have a stone beside it that I think came later. The child of New York natives James Croak (a pipe fitter in a shipyard) and Jenny Connor Croak, she only lived about a year before she died of “general biliary tuberculosis.” I’m thinking her father, skilled in working with metal, might have made this simple marker for his little girl. 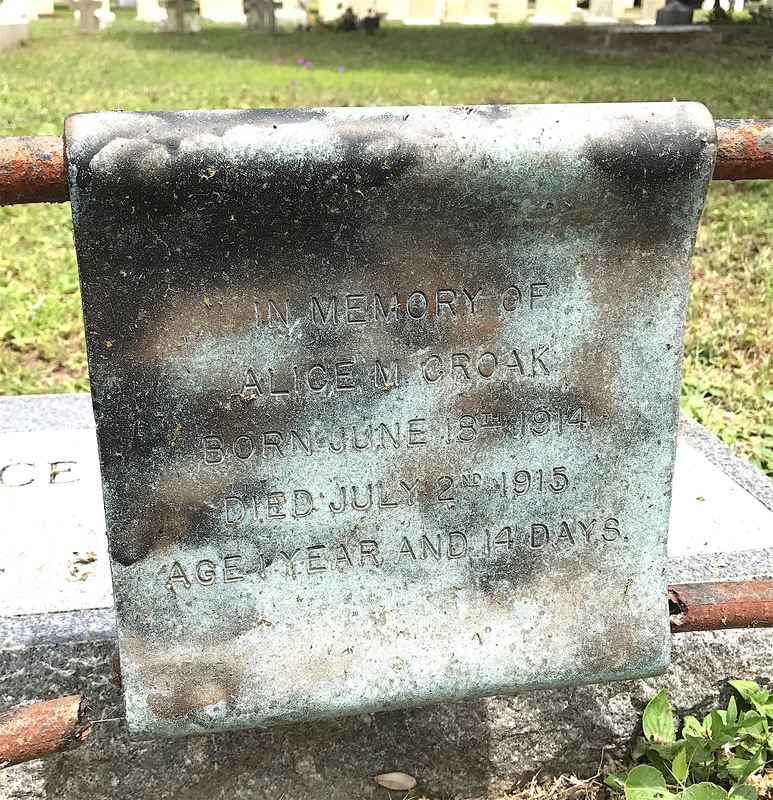 Little Alice Croak’s father, a pipe fitter, may have made this humble marker for his daughter. Alice’s sister, Agnes, would died five years later. I didn’t get a picture of it, but Alice had an older sister named Agnes who is also buried at St. Lawrence. Born in 1911, she died five years after Agnes in 1920. Her cause of death is listed as “encephalitis lethargica”. The term puzzled me until I learned that Agnes was one of about a million people around the world affected by the malady known as “sleeping sickness” between 1915 and 1926. A third died in the acute stage of the illness. It often started with an influenza‐like illness, followed by increasing drowsiness and confusion, progression to continuous sleep, stupor and finally coma. If you saw the 1990 movie “Awakenings” starring Robin Williams and Robert DeNiro, you have some idea of what it was. 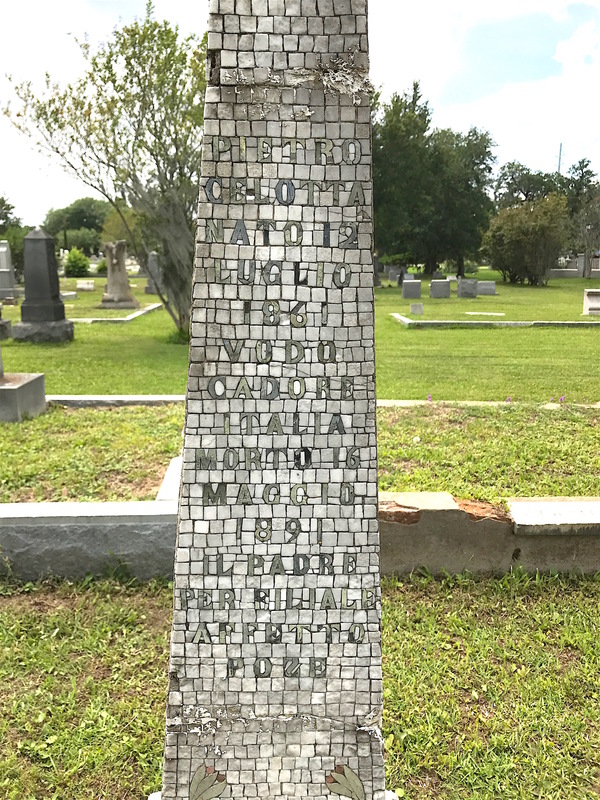 This unusual mosaic-tiled obelisk marks the grave of immigrant Pietro Celotta. Born in 1861 in the Northern Italian village of Vodo Cadore, he arrived in New York in 1885 with his father, Michelangelo, and brother, Constantine. The ship’s manifest lists them as bound for Alabama. Pietro Celotta had only been living in Charleston about 19 months when he died. At some point, Pietro moved to Charleston and worked as a confectioner. He had only been living there for 19 months when he contracted influenza and died in 1891 at the age of 30. He never married. It looks like various repairs have been made over the years to the mosaic-pieced monument. 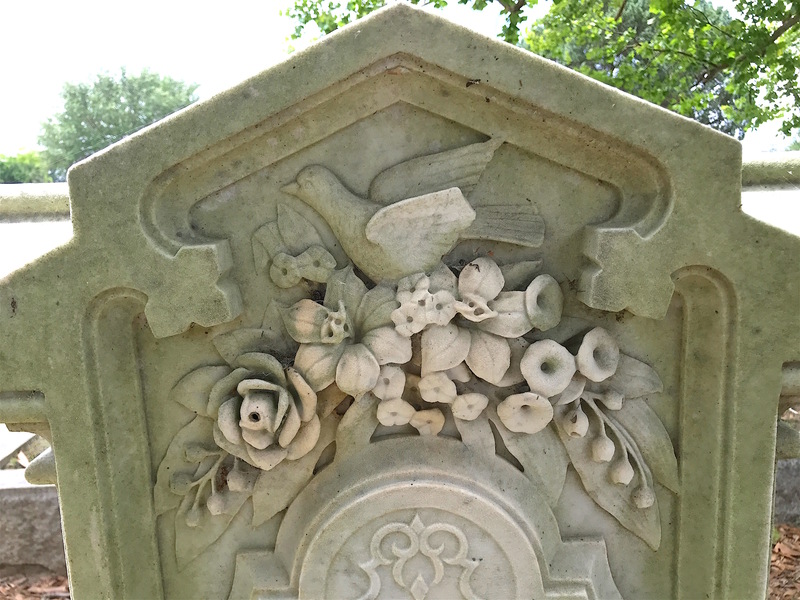 I was drawn to Fannie Moore Bickley’s grave for its beautiful profusion of blowers beneath a dove. The detail is stunning. The wife of John Bickley, Fannie died in 1895 at the age of 31. She suffered from Bright’s Disease, a kidney ailment. A dove (one wing is chipped) sits amid a profusion of blooms. The craftsmanship of this old iron gate to the Henry Oliver plot caught my eye. Despite the fact it is 118 years old, it has aged fairly well all things considered. Despite its age, the gate to the Henry Oliver plot is in good shape. 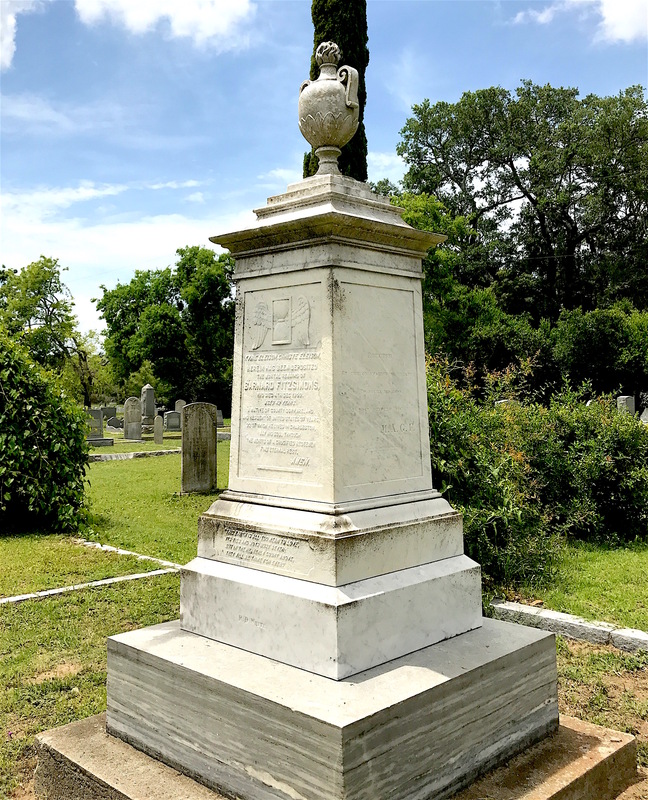 This final monument I included because I’ve seen one quite like it in Augusta, Ga. at Magnolia Cemetery (not the Magnolia Cemetery next door). They were actually carved the same year, 1888. The two women died about two months apart. The extreme draping, held by an angel, must have been a popular motif at the time. Here’s the one I saw in Augusta. Notice that the draping covers Maude Mathewson’s last name. I had to look it up on Find a Grave to find out what it was. 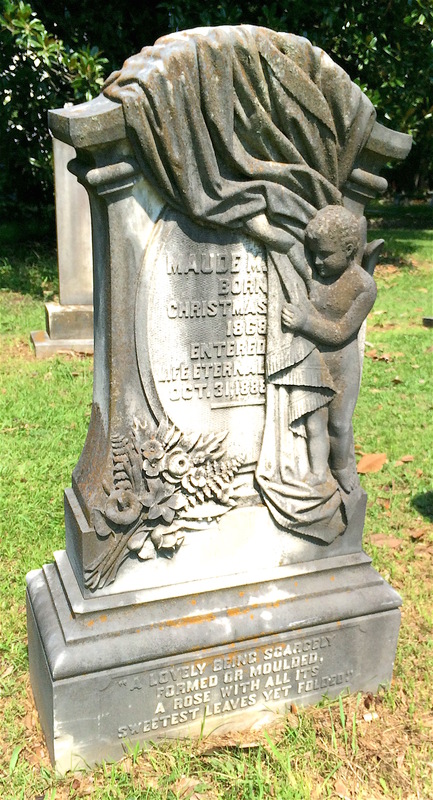 Maude Mathewson’s grave marker in Augusta, Ga. looks a lot like Henrietta Murray’s. A native of Ireland, Henrietta died of heart disease at the age of 53. She was married to steamboat captain John Murray. In this case, because her husband John’s name is inscribed in full below hers, we know that Henrietta’s last name was Murray. That’s a lot more helpful (in my mind) than what the carver did on Maude’s monument. The intricacy of the draping is more elaborate than Maude’s as well, detailed with lots of fringe and a tassel. 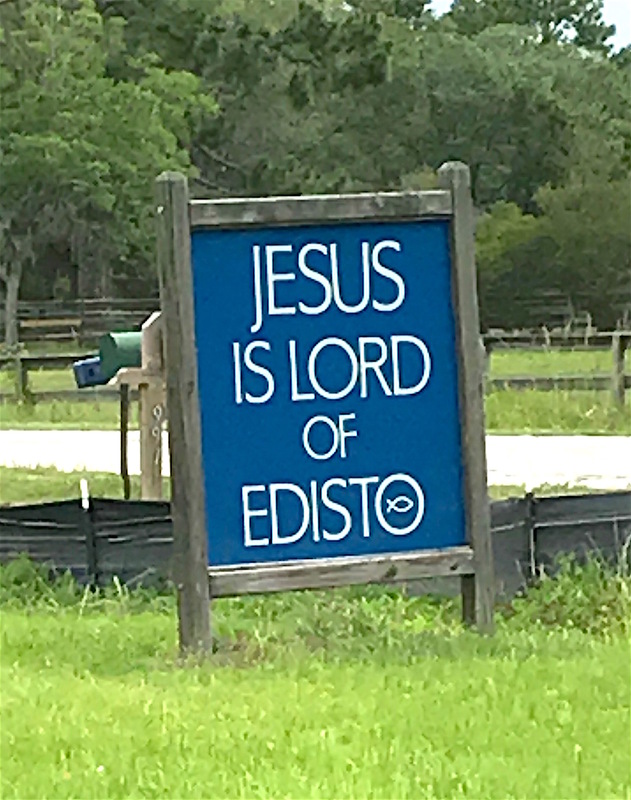 Anxious to read about Edisto. Hope you find dome Percival tombstones. I just read your latest edition tonight (5-1-18), Traci. As always…you come into some of the most interesting findings by your searches. All are started, it seems, by a uniqueness of a grave marker. After your research via “Find-a-Grave’s” web site and any possible help from the cemetery grounds office, you do a good job of explaining the mark and its history. I know that is time consuming, a bit taxing on your mind, but, in the end of the writings you make us, the readers, feel closer to the deceased. This “episode” had several unusual grave markers…and something is telling me you are bound to find more. Maybe, in a few years you might want to compile the best findings into some kind of book or…a video show (with all the “bells & whistles) to set on some media channel.